getcalc.com's Charle's (Gas) Law Calculator is an online chemical engineering tool to measure relationship between initial volume & temperature to final volume & temperature (Kelvin) of the gas, when pressure is kept constant, in both US customary & metric (SI) units. 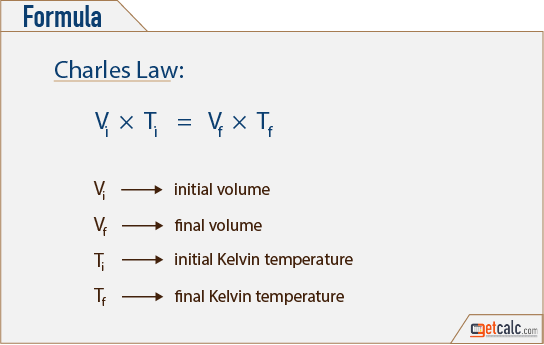 Charle's Law is the measure of relationship between the volume & absolute temperature of the gas, when pressure is kept constant. According to the law, the volume of a given mass of gas varies directly with the absolute temperature of the gas, when pressure is kept constant.